Barbara Ball, Taketha Wilkins and Elaine Blanchard at the Shelby County Division of Corrections. Blanchard teaches a class on reading and writing, and personal storytelling. 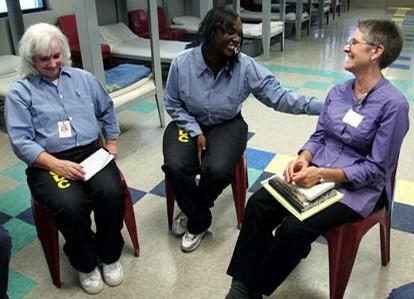 The “Prison Stories” project takes a look into the lives of women in the Shelby County Division of Corrections, and showcases their stories through theatrical performance. She "took her love and trust for story-sharing into the prison" and collects their stories through the class she leads. Through the class, the women engage in reading, writing, and personal storytelling, allowing them to "develop a deeper trust in themselves and the power of their own stories." Blanchard is a member of the Memphis theatre company, Voices of the South. “Prison Stories” is one of their productions, with performances coming up on January 20 and 21 at First Congregational Church in Midtown.